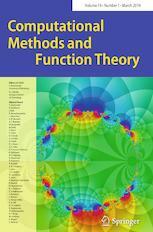 CMFT is an international mathematics journal which publishes carefully selected original research papers in complex analysis (in a broad sense), and on applications or computational methods related to complex analysis. Survey articles of high standard and current interest can be considered for publication as well. Contributed papers should be written in English (exceptions in rare cases are tolerated), and in a lucid, expository style. Papers should not exceed 30 printed pages.